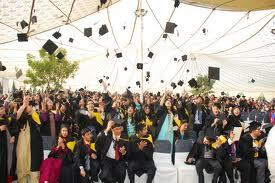 Lahore School of Economics (LSE) organied its 11th convocation on Saturday at Burki Campus. The event commenced with the LSE Rector Dr Shahid Amjad Chaudhry’s address. In his speech he said that the LSE has emerged as one of the finest academic institutions in Pakistan, renowned for its academic excellence and the quality of its faculty and its student body. He said that LSE was graduating 967 students of which 18 were graduating with MPhil: 3 MPhil in Business, 8 MPhil in Economics, 7 MPhil in Environmental Science and Policy, 289 with MBA’s, 3 with MSc in Economics, 420 with BBA Honours, 125 with BSC Honours in Economics and 12 with BS Honours in Social Sciences. The rector, in his speech, highlighted the achievements of the school in the previous year. He mentioned that the students actively participate in debates and social work. More than 200 leading companies have hired LSE graduates so far. Dr Shahid also mentioned that the school faculty is publishing research papers in a number of international journals as well as collaborating in research with leading universities including Oxford, Columbia and Yale. Dr Shahid also mentioned that the school will hold annual conference on the management of the Pakistan economy by the end of March 2014 and it will focus on the external sector. In the end the rector thanked the LSE board of governors, faculty and staff and congratulated the graduating students on their success and their parents for making it possible. After that the rector conferred degrees upon graduates and presented the gold and silver medals to the high achievers.